WHAT: Statue of “Connecticut” in Shockoe Bottom in Richmond, Virginia. WHERE: Lucky Strike building at 2700 East Cary Street in Shockoe Bottom. 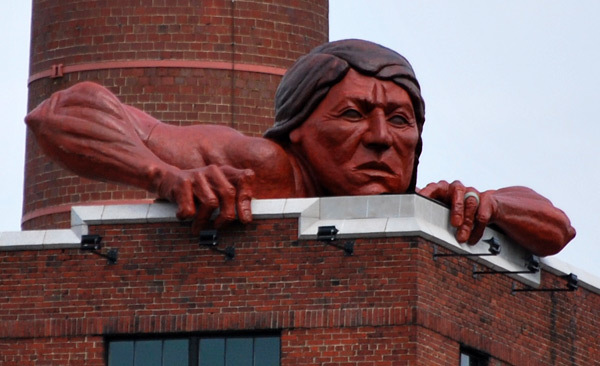 DESCRIPTION: This fiberglass and resin composition resembles a giant Indian brave peering out over a parapet. The statue measures 25 feet by 13 feet by 9 feet and weighs 2,400 pounds. It now overlooks the James River in the area near Great Shiplock Park. The statue had been a mainstay at The Diamond during much of the Richmond Braves time at the baseball stadium, on loan from the artist. When the Braves moved out of town, the idea of a tribute to Native Americans at the stadium diminished, prompting the need to find a new home for Connecticut. The Lucky Strike building was one of three finalists for the 25-year-old statue, including Powhatan and Henrico high schools, in that order. 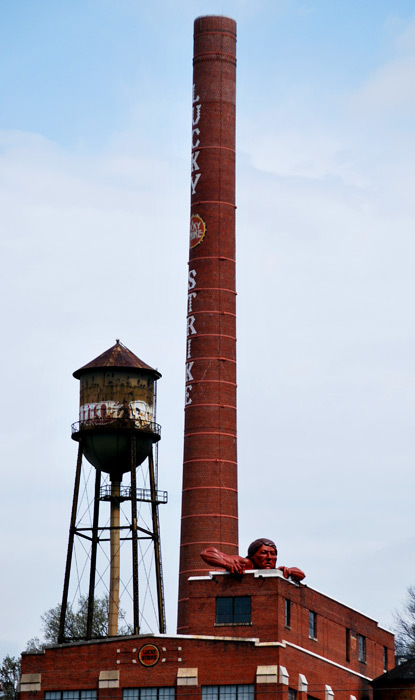 The board said that the Lucky Strike location provided the sculpture with the most visibility to the public. In a news release from Odell Associates, “Connecticut,” from the Native American word Quinnehtukqut, translates “beside the long tidal river.” Sculptor Paul DiPasquale chose this name because of his original intention to unveil this monumental tribal tribute in Washington, D.C., along the tidal Potomac River. With the selection of Lucky Strike @ Power Plant as Connecticut’s home, the Indian finally rests as intended, beside the long tidal river — the James River. The Power Plant @ Lucky Strike is a joint venture between Mac Partners and Odell Associates. This historic landmark recognized in 2009 by the American Institute of Architects and Greater Richmond Area Commercial Real Estate as an Award winning Historical Adaptive Re-Use project. WHAT: Statue of Matthew Fontaine Maury on Monument Avenue in Richmond, Virginia. WHERE: Monument and Belmont avenues in the intersection. 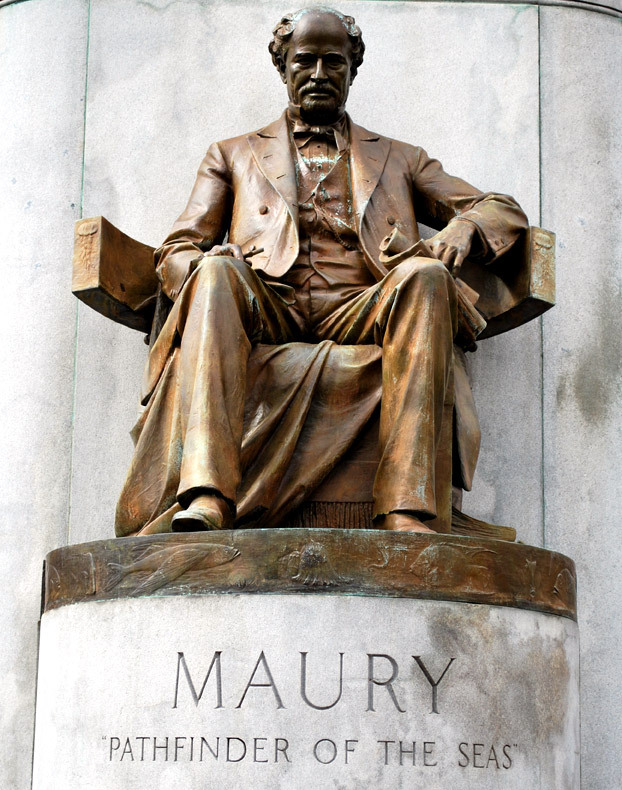 DESCRIPTION: A seated bronze figure of Maury which is 8 foot high on a 5 foot high granite pedestal. 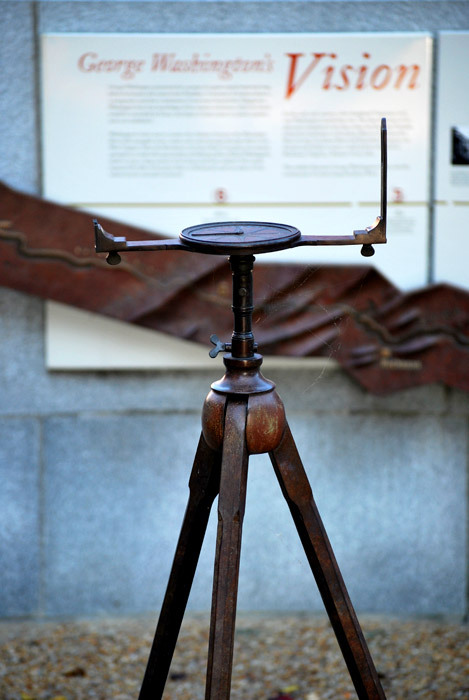 This grouping sits in front of a 18 foot high base which supports a 9 foot diameter bronze globe. 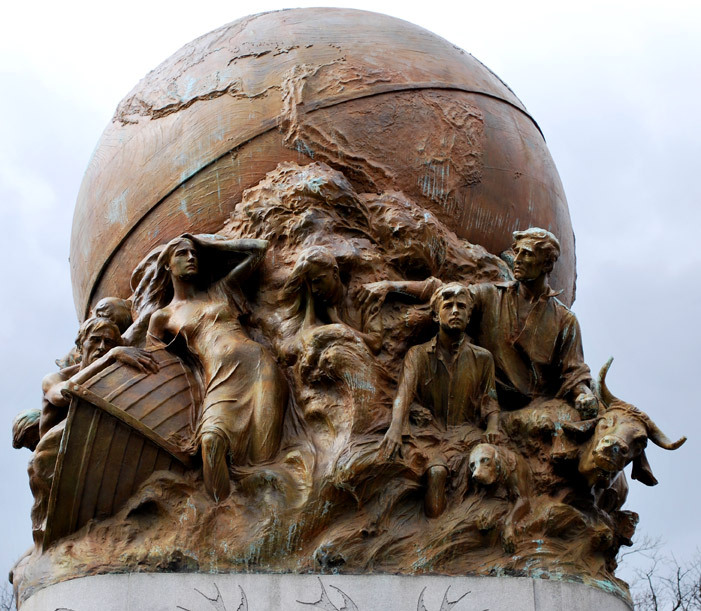 At the base of the globe a storm is raging with figures being tossed by a swirling wave. This carefully conceived allegorical theme is a tribute to Maury’s study of the ocean, winds and currents. Confederate naval officer and explorer Matthew Fontaine Maury was known as the “Pathfinder of the Seas.” Although he never fought a battle and was prone to seasickness, Maury became one of the U.S. Navy’s most accomplished officers. The enigmatic nature of his statue reflects his unusual place in the pantheon of Confederate and Virginia heroes. The carefully conceived allegorical theme is a tribute to Maury’s study of the ocean, winds and currents. It was dedicated November 11, 1929, and rests in the intersection with Belmont Avenue. 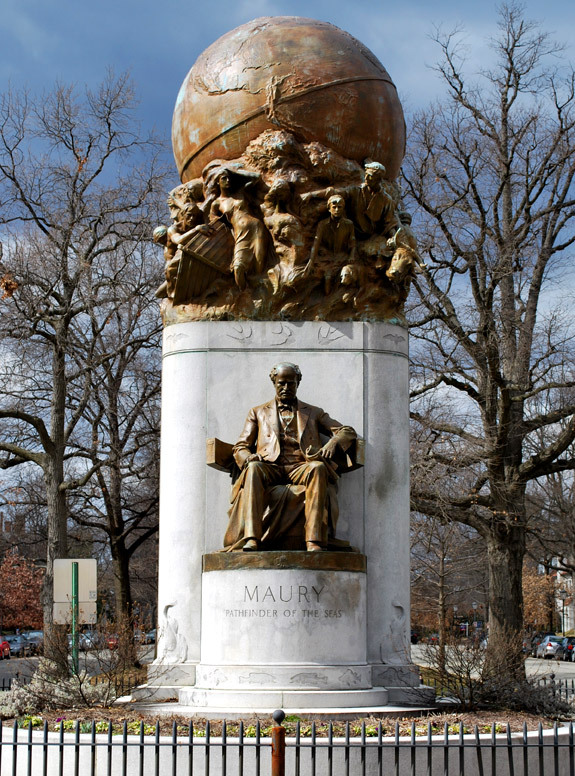 Maury’s grave can be found in President’s Circle at Hollywood Cemetery. WHAT: “George Washington’s Vision” at the Canal Walk Turning Basin in downtown Richmond, Virginia. LOCATION: West of the intersection of 14th and Dock streets. 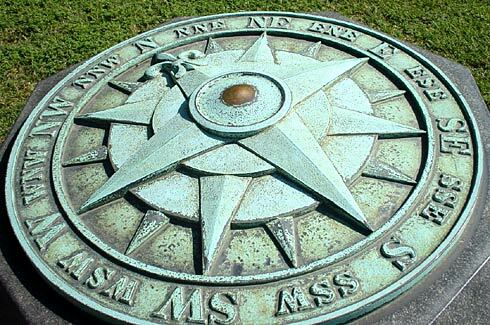 DESCRIPTION: The granite and bronze display is arranged in a circle and centered with a surveyor’s compass. The text and map within the display highlight the key points of the Kanawha Canal and Washington’s vision of connecting the Atlantic Ocean to the Mississippi River. George Washington promoted the concept of a great central waterway long before he became this nation’s first President. A surveyor of western lands as a young man, and later a landowner of vast tracts beyond the Alleghenies, Washington had close knowledge of the western territories, which he feared would be controlled by France and Spain if trade routes to eastern markets were not established. Washington’s vision was to connect the Atlantic Ocean to the Mississippi River with navigable rivers, canals, and a land portage through what is now West Virginia. 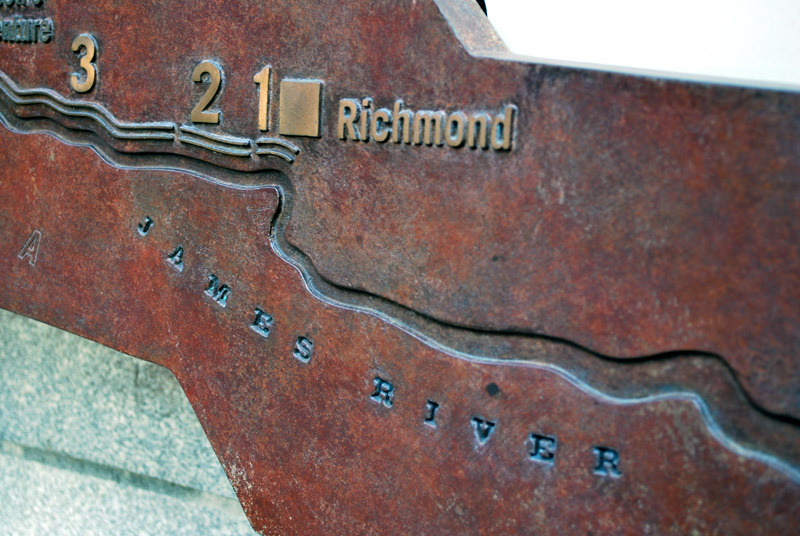 After the Revolution, the James River Company was created, primarily as a result of his sponsorship and lobbying efforts. Before Washington’s death in 1799, a large portion of his dream had been realized. Two canals bypassed the falls of the James River at Richmond, and 220 miles of river improvements extended westward. In the early 19th century, other farsighted Virginians took over Washington’s leadership role. The final elements of his plan were completed in the 1820s, when the Kanawha Turnpike joined the headwaters of the James River to the Kanawha River. In 1835, the James River and Kanawha Company was formed, and within 15 years a canal system stretched to Buchanan, Virginia, a distance of 197 miles. 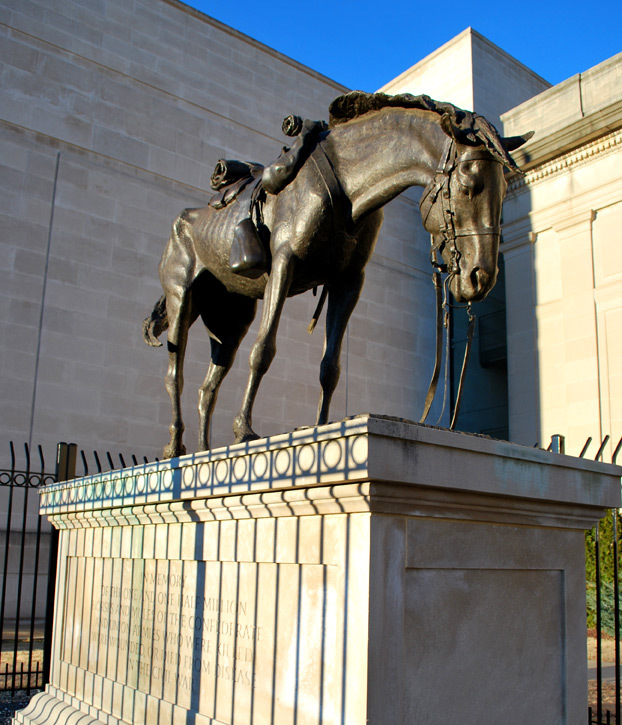 WHAT: The War Horse at the Virginia Historical Society on The Boulevard, Richmond, Va. LOCATION: 428 North Boulevard, Museum District. 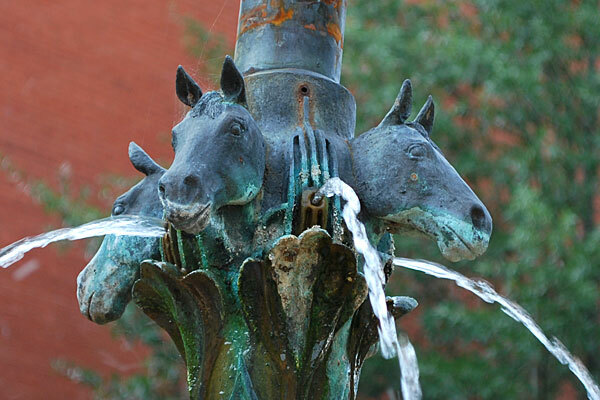 DESCRIPTION: The bronze horse sculpture is mounted on a six-foot base and surrounded by a high iron fence. The statue stands in front of the Virginia Historical Society on The Boulevard. 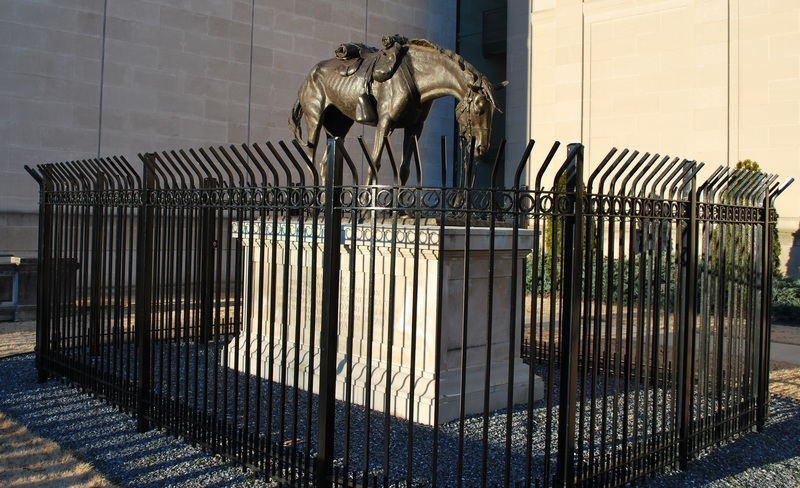 The War Horse is a memorial to the Civil War horse, designed by Tessa Pullan of Rutland, England, and given to the historical society by Paul Mellon. In memory of the one and one half million horses and mules of the Confederate and Union armies who were killed, were wounded or died from disease in the Civil War. The first thing most people notice with the statue is the ribs. The horse is intentionally gaunt and overly thin, indicating how difficult it must have been for the dedicated domesticated animals during the Civil War. The best time to see the statue may be at night, as a floodlight focused on The War Horse helps cast a huge shadow on the granite walls of the VHS. Take a walk or drive by on The Boulevard some evening to see for yourself. 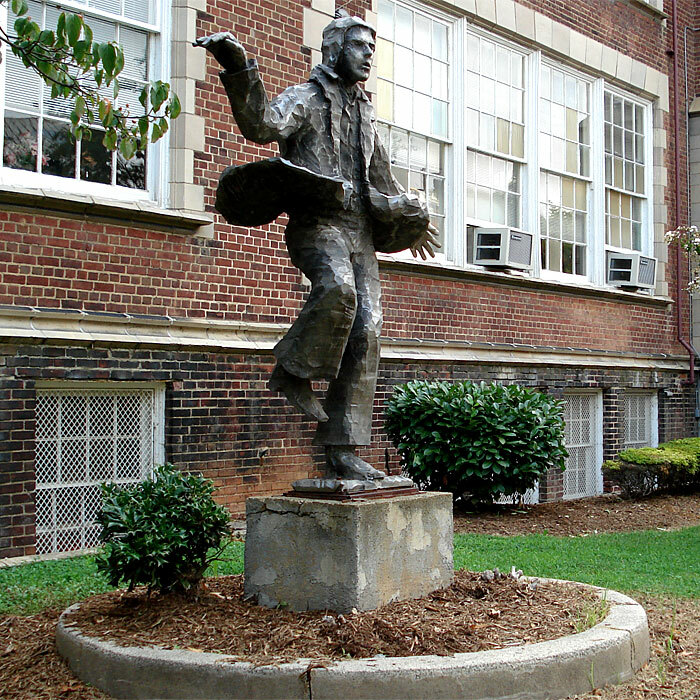 WHAT: “The Dancing Man” statue at Bellevue Elementary School in Richmond’s Historic Church Hill District. LOCATION: 2301 East Grace Street. DESCRIPTION: Bronze figure of an odd man with what appears to be a tutu from certain angles. The tails of his coat are upturned in the wind, giving the impression of wings. LOCATION: Just east of the intersection of Grace and 9th streets at the northwestern corner of Virginia State Capitol Square, downtown Richmond, Va. DESCRIPTION: The three-foot tall stone and bronze marker is the is the official Virginia highway point of measurement of distances from Richmond for Virginia. 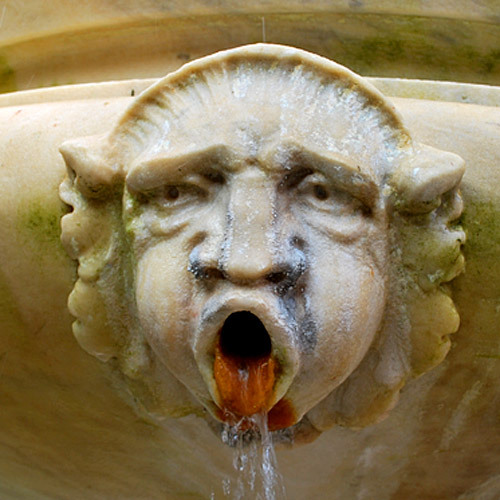 The indiscrete marker is an easy point to miss among the many sculptures and monuments on the grounds of Capitol Square. An inscription says “Zero Milestone, Virginia Highways.” It is located at N 37° 32.380 W 077° 26.046 18S E 284947 N 4157525. 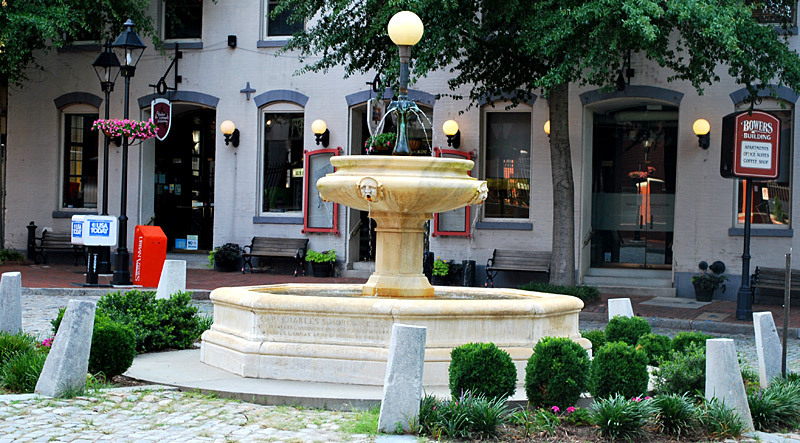 If you have ever walked the Very Richmond cobblestone streets of Shockoe Slip, it would be near impossible to miss the fountain that resides in front of the Martin Agency and the many restored warehouses and storefronts in the area. This event is scheduled annually for noon on the second Friday in December. It has taken place every year since 1992 and is intentionally brief (about 30 minutes) so people can participate during their lunch hour and local businesses are encouraged to make it a “pet-friendly” day at the office.